Since the 1950s, research suggests, we have become more and more distanced from nature and its life-giving benefits. It’s hard to overstate how much good nature does for our well-being: Study after study documents the psychological and physical benefits of connecting with nature. People who are more connected with nature are happier, feel more vital, and have more meaning in their lives. Even in small doses, nature is a potent elixir: When their hospital room had flowers and foliage, post-surgery patients needed less painkillers and reported less fatigue. And merely looking at pictures of nature does speed up mental restoration and improves cognitive functioning. These studies, along with hundreds of others, all point to the same conclusion: We stand to benefit tremendously from nurturing a strong connection with nature. Yet our connection to nature seems more tenuous than ever today—a time when our children can name more Pokémon characters than wildlife species. It is widely accepted that we are more disconnected from nature today than we were a century ago, but is that actually true? A recent study we conducted suggests that it is—and that may be bad news not only for our well-being but also for the environment. To find out how the human relation to nature has changed over time, we asked ourselves: How can we define and measure all the various ways in which people connect with nature? How can we count all the times people stop to watch a sunset or listen to birds chirping, or how long they spend walking tree-lined streets? We could certainly ask these questions to living people, but we couldn’t ask people who lived a hundred years ago. Instead, we turned to the cultural products they created. Works of popular culture, we reasoned, should reflect the extent to which nature occupies our collective consciousness. If novelists, songwriters, or filmmakers have fewer encounters with nature these days than before, or if these encounters make less of an impression on them, or if they don’t expect their audiences to respond to it, nature should feature less frequently in their works. We created a list of 186 nature-related words belonging to four categories: general words related to nature (e.g., autumn, cloud, lake, moonlight), names of flowers (e.g., bluebell, edelweiss, foxglove, rose), names of trees (e.g., cedar, laburnum, whitebeam, willow), and names of birds (e.g., finch, hummingbird, meadowlark, spoonbill). Next, we checked how frequently these 186 words appeared in works of popular culture over time, including English fiction books written between 1901 and 2000, songs listed as the top 100 between 1950 and 2011, and storylines of movies made between 1930 and 2014. Across millions of fiction books, thousands of songs, and hundreds of thousands of movie and documentary storylines, our analyses revealed a clear and consistent trend: Nature features significantly less in popular culture today than it did in the first half of the 20th century, with a steady decline after the 1950s. For every three nature-related words in the popular songs of the 1950s, for example, there is only slightly more than one 50 years later. Love is now the stardust of yesterday. This pattern of decline didn’t hold for another group of words we tested—nouns related to human-made environments, such as bed, bowl, brick, and hall—suggesting that nature is a unique case. How can we explain this shrinking of nature in our collective imagination and cultural conversation? 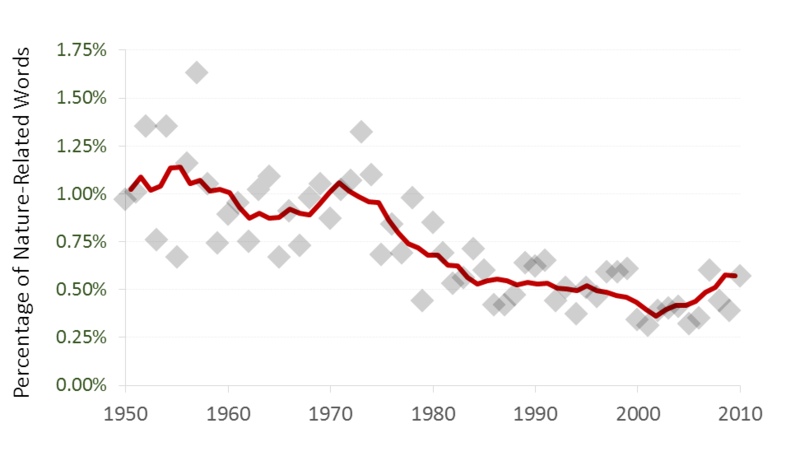 A closer look at the data yields an interesting clue: References to nature declined after, but not before, the 1950s. The trend of urbanization—which swallows up natural areas and cuts people off from natural surroundings—is typically used to explain the weakening human connection to nature, but our findings are not consistent with that account. Urbanization rates did not change from the first half of the 20th century to the second in the U.S. and U.K., where most works we studied originated. Instead, our findings point to a different explanation for our disconnection from nature: technological change, and in particular the burgeoning of indoor and virtual recreation options. The 1950s saw the rapid rise of television as the most popular medium of entertainment. Video games first appeared in the 1970s and have since been a popular pastime, while the Internet has been claiming more and more leisure time since the late 1990s. It stands to reason that these technologies partially substituted for nature as a source of recreation and entertainment. 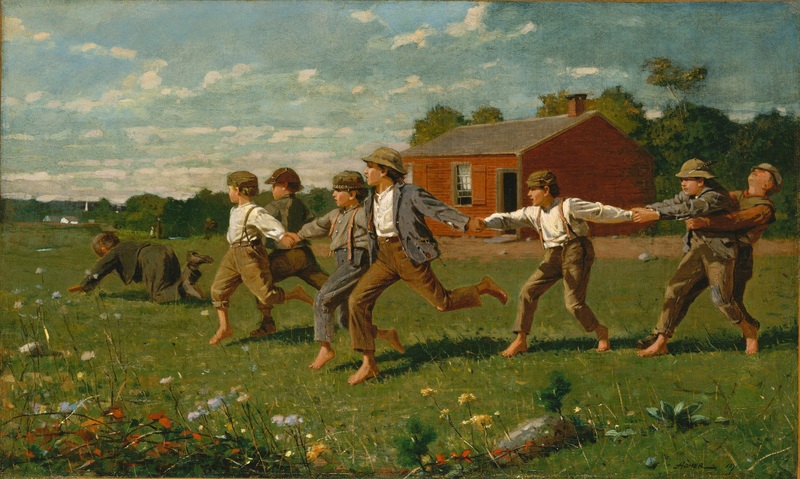 Classic paintings such as Winslow Homer’s Snap the Whip (1872) or Seurat’s Sunday Afternoon on the Island of La Grande Jatte (1886) point to a time when children played in wide open green fields and adults spent their Sunday afternoons in nature. It’s worth remembering that cultural products such as songs and films not only reflect the prevailing culture—they also shape it. Modern artists have the opportunity to send the message that nature is worth paying attention to and to help awaken curiosity, appreciation, and respect for nature, as some did back in the ‘60s and ‘70s. Artistic creations that help us connect with nature are crucial at a time like this, when nature seems to need our attention and care more than ever. Selin Kesebir, Ph.D., has a degree in Social Psychology and is an assistant professor of organizational behavior at London Business School. Pelin Kesebir, Ph.D., has a degree in Social Psychology and Personality and works as an assistant scientist at the Center for Healthy Minds at the University of Wisconsin—Madison. She studies happiness and virtues, and the different ways in which well-being can be improved.